A dental implant is an artificial tooth root that your dentist places into your jaw to hold a replacement tooth (crown), bridge or a full set of dentures. Dental implants are an ideal option for people in good general oral health who have lost a tooth or teeth due to periodontal disease, an injury, or some other reason. While high-tech in nature, dental implants are actually more conservative than traditional bridgework, since implants do not rely on neighboring teeth for support. Dental implants look and feel so much like a natural tooth that you may forget you ever lost it in the first place. You know that your confidence about your teeth affects how you feel about yourself, both personally and professionally. Perhaps you hide your smile because of spaces from missing teeth. Maybe your dentures don’t feel secure. Perhaps you have difficulty chewing. If you are missing one or more teeth and would like to smile, speak, and eat again with comfort and confidence, there is good news! 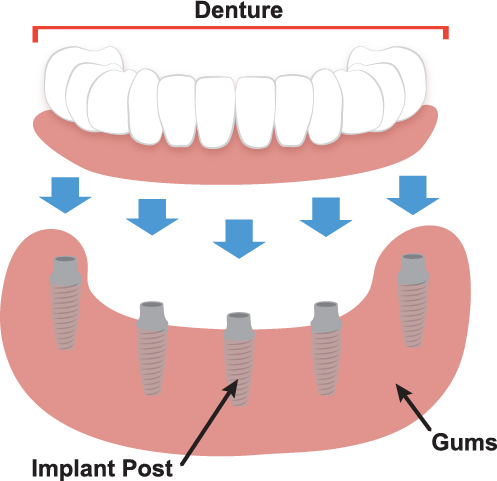 Dental implants are tooth root replacements that can look and feel just like your own! Under proper conditions and diligent patient maintenance, implants can last a lifetime. Long-term studies continue to show improving success rates for implants. Aesthetics – Dental implants look and feel like your own teeth! Since dental implants integrate into the structure of your bone, they prevent the bone loss and gum recession that often accompany bridgework and dentures. No one will ever know that you have a replacement tooth. Save Teeth – Dental implants don’t sacrifice the quality of your adjacent teeth like a bridge does because neighboring teeth are not altered to support the implant. More of your own teeth are left untouched, a significant long-term benefit to your oral health! Confidence – Dental implants will allow you to once again speak and eat with comfort and confidence! You can feel confident smiling knowing others can’t see a space from a missing tooth. They are secure and offer freedom from the constant clicks and wobbles of dentures. They’ll allow you to say goodbye to worries about misplaced dentures and messy pastes and glues. The ideal candidate for a dental implant is in good general and oral health. Adequate bone in your jaw is needed to support the implant, and the best candidates have healthy gum tissues that are free of periodontal disease. If you have experienced gum or bone recession we are sometimes able to supplement those tissues with surgical grafting techniques. As you know, your own teeth require conscientious at-home oral care and regular dental visits. Dental implants are like your own teeth and will require the same care. In order to keep your implant clean and plaque-free, brushing and flossing still apply! Periodic follow-up visits will be scheduled to monitor your implant, teeth, and gums to make sure they are healthy. Contact Natural Smiles Dentistry, your Salt Lake City Dental Implant Specialist today!